October already! Can you believe it?! When Halloween rolls around, don't throw away the filling when you carve your spooky pumpkin lantern. Pumpkin is really good for you, and it is included in the list of 100 free foods that those on the Dukan diet can indulge in as much as they like, so make sure to save the inside so you can enjoy some Halloween snacks and meals that are tasty and seasonal. Pumpkin makes a great way to add an exciting variation on the daily allowance of oat bran that must be consumed on the diet. Oat bran works to fill you up and keep you satisfied for longer, meaning that you don't feel the urge to snack or feel hungry as you might on most diets. Making your oat bran into muffing creates easy, on the go portions that can be carried around for lunch at work or just for a snack, or you can enjoy them as part of a healthy, filling breakfast at the start of the day. 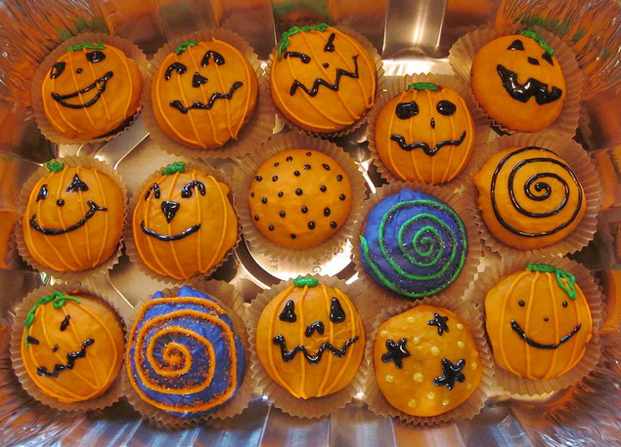 These Halloween themed muffins are just as versatile and can be enjoyed whenever you can get your hands on a pumpkin. First, cook your pumpkin. Chop the flesh into chunks and boil in a pan of water until it's tender when pressed with a fork. Once this is done, puree or mash the cooked pumpkin with a hand blender or masher. When the pumpkin mix has cooled measure out the 245g needed for this recipe. The rest of the pumpkin can be used as an addition to yogurt for a delicious dessert or breakfast, or save it for more muffins. In a separate bowl, mix all of the dry ingredients together. Now add the pumpkin, yogurt and eggs and whisk until the mixture is smooth. Add your drop(s) of vanilla flavouring. Divide the batter into a muffin tray and smooth down for an even finish. Bake the tray at 200 degrees c for 30 minutes. The muffins will taste fantastic straight out of the oven, but once cooled they can be kept in an airtight container and should last for a good few days. The addition of pumpkin and cinnamon make for a moreish, spiced taste and the pumpkin also adds to the moistness of the muffin's texture. Thought you could never enjoy muffins on a diet? Think again! Following the Dukan plan, with it's wide choice of accepted ingredients and recipes, allows you flexibility with your eating habits, letting you easily incorporate it into your lifestyle and still enjoy celebrating holidays and events such as Halloween with friends and family. Are you trialling the Dukan diet?